Talk to any dermatologist or doctor and they’ll tell you that the earlier you start slathering on SPF protection daily, the better off you’ll be. But why is SPF so crucial to maintaining your overall health? And why did we say daily? Let’s break it down. Those three letters stand for Sun Protection Factor, which is the measure of a sunscreen’s ability to prevent ultraviolet (UV) radiation from damaging your skin. What about that number that’s assigned to every SPF? Think of it this way: If your unprotected skin begins to burn in 20 minutes of sun exposure, properly applying an SPF 15 sunscreen allows you to stay in the sun 15 times longer without burning — about five hours. While SPFs can go as high as 100, no sunscreen exists that can entirely block all UV rays. It’s also important to know that an SPF 30 doesn’t provide twice the protection as an SPF 15. According to the Skin Cancer Foundation, tests have shown that SPF 15 sunscreens filter out 93% of UVB rays, while SPF 30 protects against 97% and SPF 50 98%. And regardless of the SPF level you choose, you’ll need to reapply it every two hours if you’ll be spending extensive time outside — especially if you go swimming, have serious perspiration (no judgments!) or have toweled off. Why do we need SPF protection? Not to be dramatic, but the sun ravages our skin. Specifically, two types of UV rays: UVA and UVB, which do serious damage to our skin on a cellular level, causing it to age prematurely and increasing your risk of skin cancer. UVA rays, which hang around during all daylight hours — even if there’s plenty of cloud cover — contribute to some forms of skin cancer (basal cell, squamous cell and melanoma) and cause photoaging (think: fine lines, wrinkles, sagging skin and sun spots). This is because UVA rays penetrate deep into the dermis, where they do extensive damage to collagen fibers, causing collagen to deplete and elastin to weaken. The result is skin that’s leathery, loose and prematurely aged. UVA rays are the reason behind your tan skin. But here’s the real kicker: While you may love that golden glow, a tan is your skin’s answer to injured DNA; the darkening of your skin (which is actually a mutation, go figure) is your body’s way of trying to prevent further DNA damage. In other words, a tan is not a good thing. While UVA rays tan and deeply penetrate the skin, UVB rays cause reddening and sunburns because they only affect the outermost layers of skin. UVB rays, which are strongest during the warmer months between the hours of 10 AM and 4 PM, can cause skin cancer as well as contribute to photoaging. Lest you think UVB rays only strike while the temperature’s warm, think again: They can damage your skin year-round — even when you’re skiing, when they hit reflective surfaces like snow and ice and actually bounce back to hit your skin two-fold! The combined effect of UVA and UVB rays can lead to skin cancer. 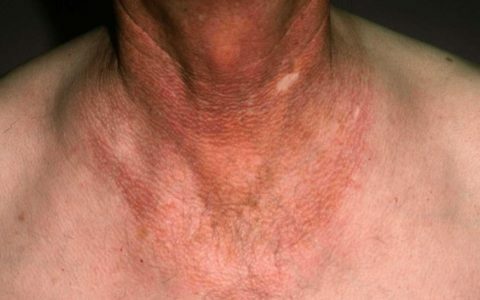 When your skin experiences serious sunburns or displays sun damage markers like sun spots, actinic keratosis (a crusty, scaly growth caused by UV exposure) and solar elastosis (when the skin appears thick and yellow as a result of sun exposure), you are at a higher risk for cancer. So, that’s the bad news. But the good news is that by regularly slathering on a sunscreen with SPF 30 or higher, you effectively decrease your skin’s exposure to UVA and UVB rays. This, in turn, prevents cellular damage, which helps combat burning, photoaging, and cancer. Doctors and dermatologists recommend you apply one ounce (equal to a full shot glass) of sunscreen every single time you reapply, and that your first application should be about 30 minutes prior to sun exposure. This probably seems excessive, and for daily use, it is. But these more rigorous application tips are crucial when you’re outdoors for extended periods of time. For everyday life, using a moisturizer or lotion containing SPF 15 or higher should be a daily practice. We’re exposed to more sun than we realize day to day, and unprotected exposure can build up over time, leading to all the same side effects. Sure, you can skip a day or two and be OK, but making SPF a part of your regular skin care regimen truly is your first line of defense against serious skin issues that can greatly impact your health. We’d say living a long, cancer-free life is worth the tedium. 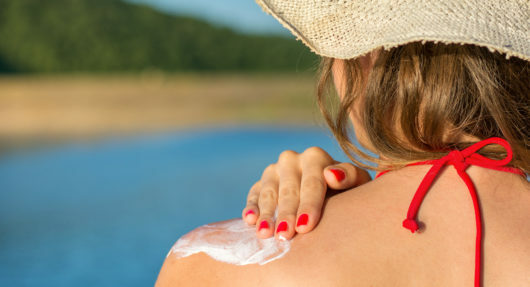 You may have heard some things that deterred you from regular sunscreen use — there’s a lot of misinformation out there that contributes to the confusion. The first myth: Wearing sunscreen causes vitamin D deficiency. This has no basis in scientific studies. While it is true that the sun helps your body produce vitamin D, you actually don’t need UV rays to get your vitamin D. Instead, you can take over-the-counter vitamin D3 supplements, which provide the recommended amount you need — minus any skin damage due to sun exposure. The second myth: Wearing long-sleeve shirts and pants provide enough protection against the sun. While covering up certainly helps, using SPF sunscreen is still a necessity. Clothing provides differing levels of SPF protection (tightly woven fabric and darker colors are better, and there are some fabrics specially made to absorb UVB rays), but sunscreen does a better job of effectively protecting skin. Plus: You don’t typically cover your face and hands with clothing. The third myth: 80% of your sun exposure occurs during your childhood, therefore the damage is already done by the time you’re an adult. So not true! Studies have shown that our skin soaks up less than 25% of our total sun exposure by age 18. Add to that the fact that we are living for longer and it becomes imperative that we continue ongoing prevention efforts well into our golden years. Other common myths we’ve debunked for you: People with acne prone skin should avoid SPF and those with darker complexions don’t need sunscreen. Both entirely false! Okay, now you’re convinced it’s time to incorporate an SPF into your daily routine. But which one should you get? Check the ingredients panel to make sure the sunscreen offers broad-spectrum protection — meaning it protects against both UVA and UVB rays. Then, determine what you’ll be doing while wearing it: Are you simply walking to work or are you running a marathon? Moisturizers with SPF 15 work well for everyday use (we love SLMD’s Daily Moisturizer with SPF 15), but if you’ll be outdoors for an extended period of time, choose a stronger, water-resistant SPF of at least 30. It’s probably best to keep multiple types of SPF on hand, for all activities. Most importantly, buy ‘em and use ‘em. Your skin will thank you! Isn’t it true though that sunscreen can’t prevent damage done to the deeper layers of skin and also, people stay in the sun longer, thinking they are protected?